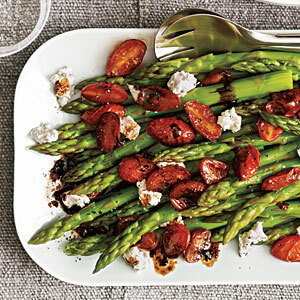 This Asparagus with Balsamic Tomatoes recipe is a quick and easy side dish for a warm spring or summer night. See variations below for 2 varieations. Raisin and Pine Nut variation: Omit tomatoes, garlic, vinegar, and goat cheese. Cook 1/3 cup sliced red onion and 2 tablespoons pine nuts in oil for 4 minutes. Add 2 1/2 tablespoons orange juice, 3 tablespoons raisins, and 2 teaspoons honey; cook 2 minutes. Stir in 1/4 teaspoon salt and 1/4 teaspoon orange rind. Spoon over asparagus; sprinkle with pepper. Yield: 4 servings. Calories 111; Fat 5.3g (sat 0.6g); Sodium 151mg Sesame-Ginger Glazed variation: Omit oil, tomatoes, vinegar, salt, cheese, and pepper. Microwave 1 tablespoon lower-sodium soy sauce, 1 teaspoon honey, 1 teaspoon lime juice, 1 teaspoon minced peeled fresh ginger, and garlic on HIGH for 2 minutes. Drizzle over asparagus; sprinkle with 2 teaspoons toasted sesame seeds. Serve with lime wedges. Lemon-Tarragon variation: Omit tomatoes, vinegar, and cheese; decrease pepper to 1/4 teaspoon. Combine 1/8 teaspoon lemon rind, 1 tablespoon lemon juice, 2 teaspoons chopped tarragon, garlic, 1/2 teaspoon minced shallot, 1/2 teaspoon Dijon mustard, salt, pepper, and oil. Drizzle tarragon mixture over asparagus; toss gently to coat.